OUR VISION for Worldwork 2020 is to explore in community emerging ways of relating to our most pressing world problems, daring to dream, speaking up and connecting with our individual and collective potential. To find the depths, rigor, leadership, eldership, and collective spirit needed to meet the ongoing complex, local and global issues at the edges of our known worlds. In 2019, for some, we live in a world impacted by deep divisions and polarizations around many global and local issues that raise questions about the sustainability of our practices and our viability as a species and planet. For others, the world is changing too quickly and there is a yearning for lost traditions, culture and community. How do we come together to address the issues of home, belonging, and identity? How can we work with our differences and address issues that divide us? How do we facilitate conflicts, how can we include each other to create a deeper sense of belonging, a deeper democracy? Worldwork is an opportunity to learn more about the worlds we inhabit- to experience – to feel – to explore with each other the roles that enliven and polarize us, and create a sustainable way of being together. Worldwork is an inclusive, transformative approach to collective conflict, diversity issues, and community building. We explore power dynamics, and embody issues to deepen our awareness and a sense of community and hope. Worldwork includes hard facts and dreaming, thoughts and feelings, me and you. Arnold Mindell is the founder of Process Work and Worldwork, and together with Amy Mindell and international colleagues have developed and practiced this work around the world over the past four decades. 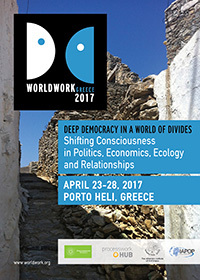 The Mindells and our international team will be facilitating at Worldwork 2020. Worldwork is a leadership and facilitator training ground to develop our capacity to work on complex and escalating issues. It is an opportunity to discover possibilities and new perspectives that may lead to solutions for community conflicts. We find and experiment with new aspects of our leadership, facilitator-ship and a sense of compassion for our worlds. Worldwork presents methods of facilitating groups at every level of interaction. Participants will be working on issues and learning skills applicable to individuals, relationships, subgroups, and large group settings. Certificates of participation will be awarded upon completion of the course. Format. These six days will include training and experience in a large group setting where a variety of issues relevant to the group and the world will be processed. Due to the enormous social differences in our world today, participants should at times expect the expression of passionate emotions that often emerge in group life. Varied styles of communication are encouraged to support the expression of diverse cultural and ethnic groups. Small groups will meet regularly to practice specific training exercises and process group issues in a more intimate environment. Group process work recognizes that relationship work and inner work are important aspects of any kind of group work, and participants may attend one-to-one sessions to focus on individual issues that may arise. Sessions are included in the price of tuition. Special interest and social awareness groups will have an opportunity for learning and networking. Where is Worldwork used: Worldwork is utilized in diverse settings including nonprofit and for-profit sectors, organizations, communities, the United Nations, government agencies, educational institutions, and areas of the world living experiencing active acute conflicts war and occupation.